Originally named Kakarotto (addressed as Kakarot in the English anime and spelled Kakarrot in the English manga), Goku is born a member of a fictional race of extraterrestrials called Saiyans. Shortly following his birth, Goku is sent from his home, a fictional planet named Vegeta, to prepare Earth for sale on the intergalactic market by destroying all its life. Due to an injury to his head that caused him severe amnesia, Goku forgets his purpose, and instead focuses on becoming stronger for little more than the pleasure of it. 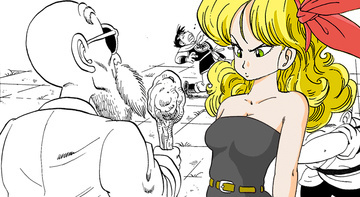 In the beginning of the series, Goku meets a highly intelligent 16-year-old teenage girl named Bulma, the desert bandit Yamcha, and two shapeshifters named Oolong and Puar. He also encounters one of his closest friends, Krillin, and others during his training. Participating in various martial arts tournaments, Goku also battles foes-turned-allies such as Tien Shinhan and Chiaotzu, as well as Piccolo Daimao's offspring of the same name. During his early adulthood, Goku meets his older brother, Raditz, an encounter that results in his death. Following the wish for his revival from the Dragon Balls, Goku continues to face other enemies linked to his heritage, such as Vegeta and Frieza, whose actions force him to transform into a Super Saiyan. After his encounter with Frieza, the focus on Goku's past is shifted away, as new enemies are introduced as threats to the fictional universe. As the series continues, Goku trains his first child, Gohan, to be his successor. When the androids appear, Goku contracts the heart virus that Future Trunks warns him about earlier. Later on, Goku sacrifices himself during the battle against the evil life form Cell, leaving Gohan to succeed him. Goku returns to Earth from the afterlife seven years later and meets his second child, Son Goten. Shortly after, he participates in the next martial arts tournament, however he is drawn into a battle for the universe against an extraterrestrial named Majin Buu. Goku also battles Vegeta after he is taken under control by Babidi. Later on, Goku kills Buu with his Genki Dama technique. During the martial arts tournament held ten years after Buu's defeat, Goku meets Buu's human reincarnation, Uub, and takes off with him, in the end of the story, intending to train him as another successor. In the anime Dragon Ball GT, which begins seven years after Goku meets Uub, Goku is transformed back into a child with a wish made by Emperor Pilaf using the Black Star Dragon Balls. Shortly after he, Trunks, and Pan all take a trip around the universe to locate the Black Star Dragon Balls and return them to Earth. Goku later battles the evil Baby, Super Android 17 and the evil shadow dragons. His final challenge is against Omega Shenron, who he eventually kills using the Genki Dama. Goku leaves with the original form of Shenron, only to appear 100 years later at the next martial arts tournament as an adult once more, where he is observing the battle between his descendant (Son Goku Jr.) and Vegeta's descendant. Goku's granddaughter Pan spots him, but he quickly departs.